Former Housing and Urban Development Secretary and Democratic presidential candidate Julian Castro speaks during the We the People Membership Summit, featuring the 2020 Democratic presidential candidates, at the Warner Theater, in Washington, Monday, April 1, 2019. Democratic presidential candidate Julián Castro on Tuesday called for the U.S. to end criminalizing illegal border crossings under an immigration plan that marks the first policy rollout of his 2020 campaign. The former San Antonio mayor unveiled his proposals at a time when President Donald Trump is threatening to shut down the southern border with Mexico. 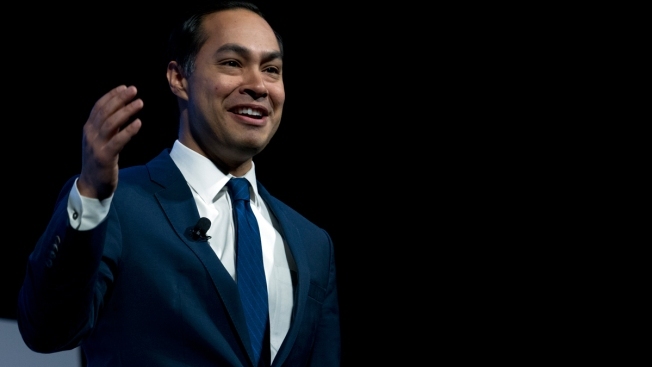 Castro, who is still searching for a toehold in a crowded Democratic field, is also now going further on immigration than his 2020 rivals who have all widely condemned Trump's border crackdowns and rhetoric. "The truth is, immigrants seeking refuge in our country aren't a threat to national security. Migration shouldn't be a criminal justice issue," Castro wrote in a blog post laying out his plan. Castro is the grandson of a Mexican immigrant and the only Latino candidate in the field. He has made reversing Trump's hardline approach to immigration a central part of his campaign since entering the race in January, and like other candidates, has called for pathways to citizenship and stopping construction on a U.S.-Mexico border wall. But his new immigration platform now includes specifics that would include making being in the U.S. illegally a civil, and not criminal penalty. Trump's "zero tolerance" policy on illegal border crossings called for prosecuting every adult, even if it meant splitting families. Castro is also calling for reconstituting U.S. Immigration and Customs Enforcement by splitting the agency in half and putting enforcement duties elsewhere. Other candidates have been less detailed about their plans for ICE, which some in the party's liberal flank have called to abolish. Castro announced a rally in his hometown of San Antonio later this month at the same time Trump is expected to make a fundraising swing through Texas.